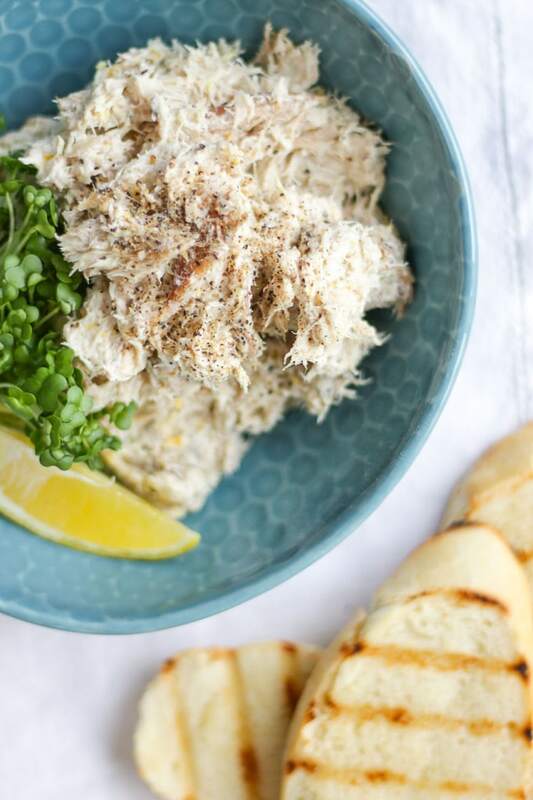 Quick and delicious Smoked Mackerel Pate recipe – this healthy snack or starter recipe is made with cream cheese, lemon and horseradish. Served with bread or salad it makes a delicious lunch. Who’s your favourite TV chef? Of course, my love of Nigella knows no bounds, but I’m also a big Jamie Oliver fan. I’m not THAT sure about the cheeky chappy banter, but I’ll always be grateful to him for introducing me to Smoked Mackerel Pate. Some time ago, on TV, he urged people who didn’t like smoked fish to try Smoked Mackerel Pate, and I did. Oh my goodness, I’ve loved it ever since. Also, surprisingly my children love this pate too. It’s worth giving it a try even if you think they may turn their noses up as it’s full of nutrients. 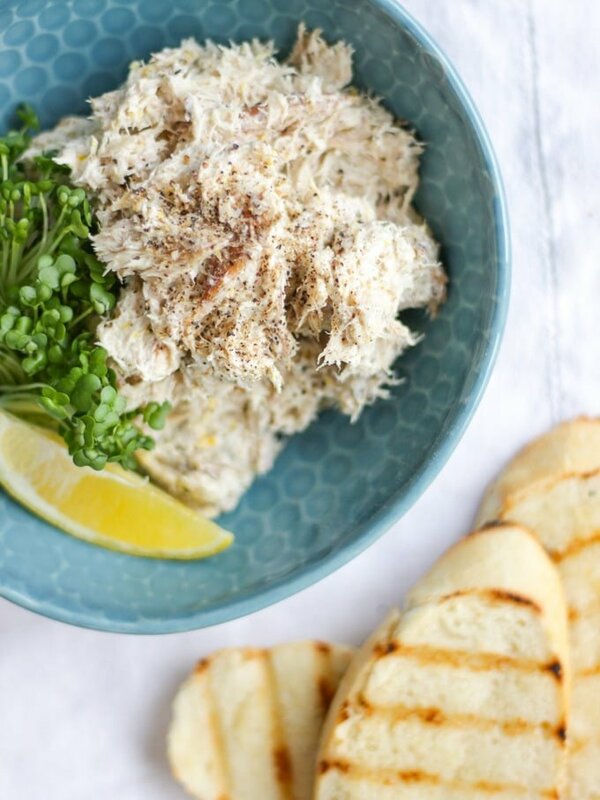 How do you make Smoked Mackerel Pate? 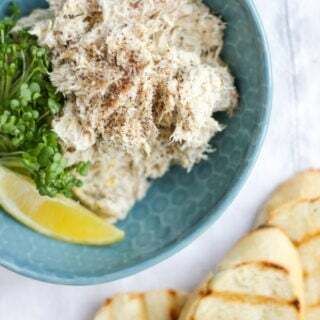 Smoked Mackerel Pate is such a simple dish to make. 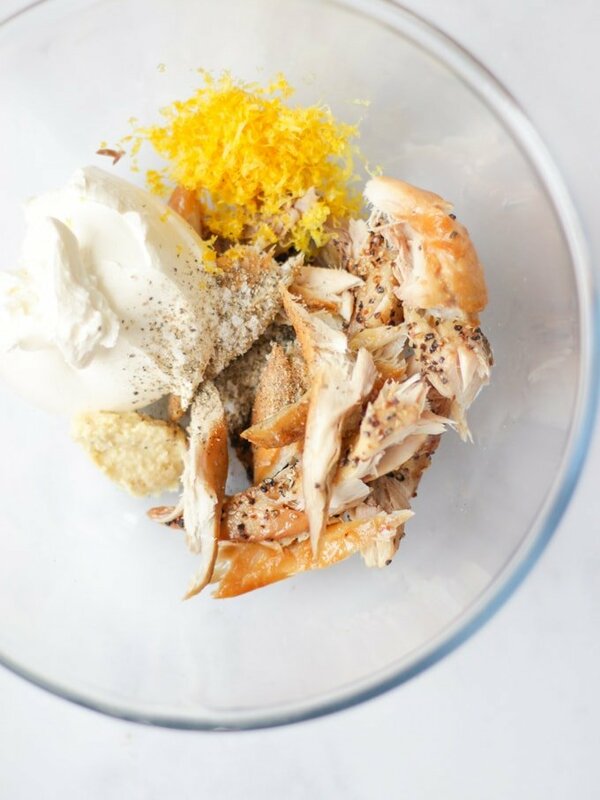 Just combine your Smoked Mackerel, flaked into pieces, with soft cheese, lemon, sea salt and pepper and some horseradish. Job done! Some people mix in a food processor, but I prefer the rough texture of mixing by hand. Mix with a fork until smooth and serve with bread, extra lemon and cress or salad. Can you freeze Smoked Mackerel Pate? Yes, I’ve successfully frozen this pate lots of times. I portion it up into small Tupperware containers like this: 200ml Lunchboxe Containers on Amazon. Then freeze until needed. If you’re taking it as a packed lunch, just remove frozen in the morning and it should be ready to eat by lunchtime. Be sure it’s full defrosted before serving. Mix thoroughly before serving and perhaps refresh with a wedge of fresh lemon. Skinless boneless mackerel fillets are more expensive than regular fillets, but it’s worth hunting them out, otherwise you’ll have to pick bones out of the fish before mixing in. I sometimes buy the peppered version to add even more flavour. 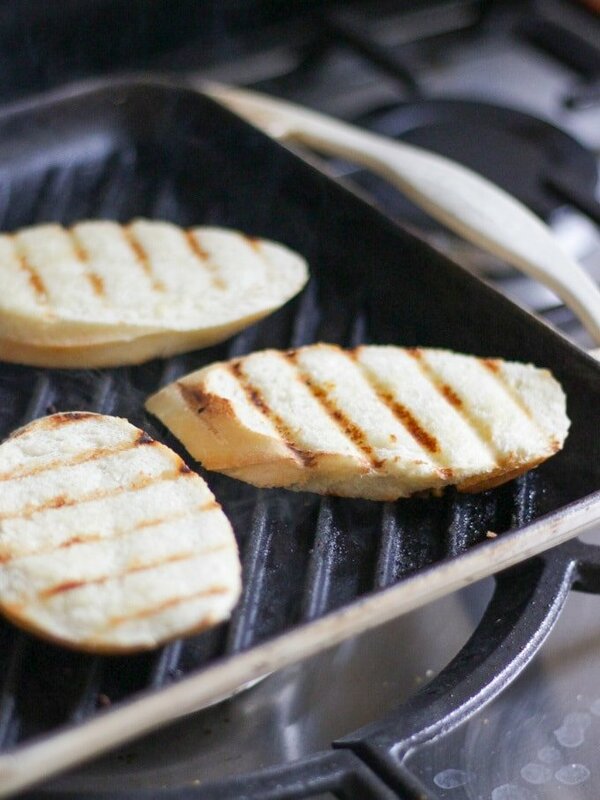 Microplane Zester – My secret weapon for any recipes with citrus zest in is my Microplane Zester. I know I’m a wimp but I used to hate making anything with lemon zest in before splashing out on one of these. 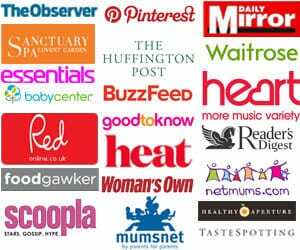 They have SO many glowing reviews. You can buy them here on Amazon: Microplane Premium Zester. Fancy some other easy fish recipes? How about my Homemade Fish Fingers or my Sweet Potato Fish Pie? Hope you enjoy this recipe as much as we do. I’d love to know how you got on and what you thought of it if you make this Chicken Enchiladas recipe. Please rate the recipe and leave me a comment below if you do. Also, if you fancy showing me a photo by tagging me on Instagram (@tamingtwins) I LOVE to see your creations. 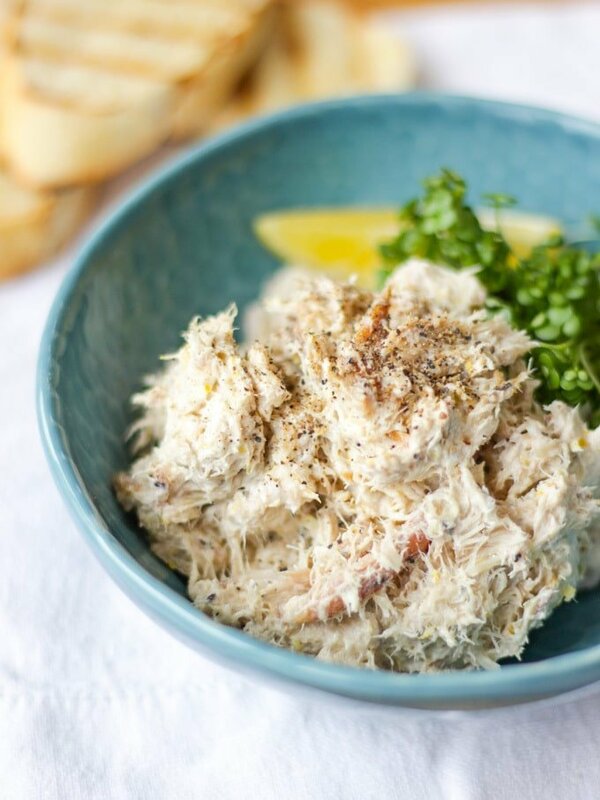 Quick and delicious Smoked Mackerel Pate recipe - this healthy snack or starter recipe is made with cream cheese, lemon and horseradish. Flake the smoked mackerel into small pieces and put with the other ingredients in a large bowl. Mix together well with a fork and serve.